An easy and quick guide to effective Lectin-free diet! In this book you can find surprising truth about meals that have long been regarded as healthy. Lectins are plant proteins. They have various functions, but can have adverse effects such as inflammation, leaky gut, and nausea, when consumed in the foods we eat. Lectins are in vegetables, legumes, seeds and dairy products, and the most likely in foods that are consumed raw. A lectin-free diet is just that, foods without the lectins. You donâ€™t need to follow a boring, special diet to build your best slim body. You can eat your favorite meals while losing weight and feeling healthier than you ever thought possible. â€¢Â Â Â 5 salads to expand the range of your light and pleasant dishes, among them, are Avocado-Lettuce Salad and Pineapple-Carrot Salad. â€¢Â Â Â 5 snacks recipes. You definitely will like them! Asparagus-Mushroom Snack and Avocado Chips. 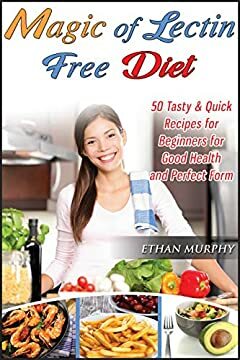 â€¢Â Â Â Soups and smoothies recipes for quick and easy cooking. Pumpkin soup or Mushroom Soup for your choice. Â Imagine eating your favorite foods and be healthy, become slim and enjoy your life! Well, scroll up, click the "Buy" button now, and know how to avoid boring diet and how to be healthier eating your favorite foods.